Smitty's on the Corner - Simply the best gourmet deli sandwiches, soups, and ice cream in the Fox Valley. Simply the best gourmet deli sandwiches, soups, and ice cream in the Fox Valley. Family owned and operated, Smitty's on the Corner uses only the freshest, most flavorful ingredients to prepare all of their mouthwatering sandwiches, homemade soups, crisp salads, ice cream and more! 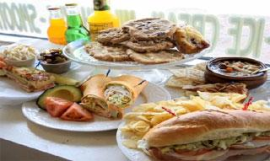 Our menu offers a wide selection for lunch, business meetings, family events and all your catering needs. For a dining experience the whole family will enjoy, visit Smitty's on the Corner today! From the Turkey Berry on Cracked Wheat Bread and the San Francisco Roast Beef to the traditional Grilled Reuben and Millie's Tuna Melt, you won't find sandwiches this delicious anywhere else in Kane County. Come by and warm up with a bowl of our hearty chili or try one of our other fresh, flavorful homemade soups. Let Smitty's on the Corner take the stress out of your next party or business meeting. We'll customize a menu to suit all your needs. Treat your guests, and yourself, to the great taste of Smitty's!